As well as having impact on general health, smoking is also bad for teeth and oral health, which is why a group of dental students from Plymouth University are working on a project to help their fellow students quit smoking. Their project is raising awareness of the harmful effects of smoking on health and signposting other students to the Stop Smoking Service in Plymouth. 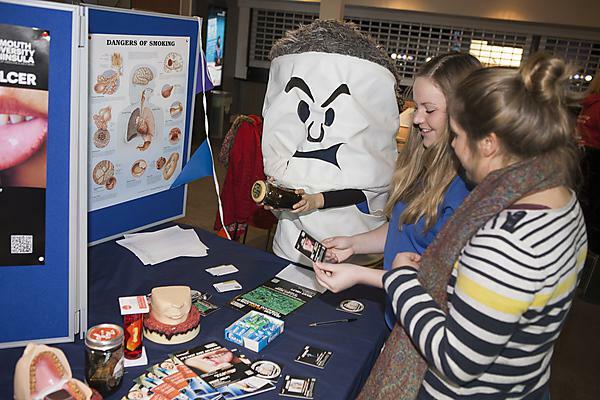 Key to the project has been an information gathering exercise which gave the dental students an understanding of others’ knowledge of and attitudes to issues associated with smoking. This highlighted areas such as confusion over how much you need to smoke to be classified as a smoker, the number of students who were already smokers before coming to university, awareness of the availability of local quit smoking services, and views on smoking and smokers (half of students would not date someone who smoked). They have been talking to students about their experiences of smoking and handing out information about how to access the support of the NHS Stop Smoking Service at Mount Gould Hospital. To help with this they have also provided the latest information to the GPs at the University Medical Centre.